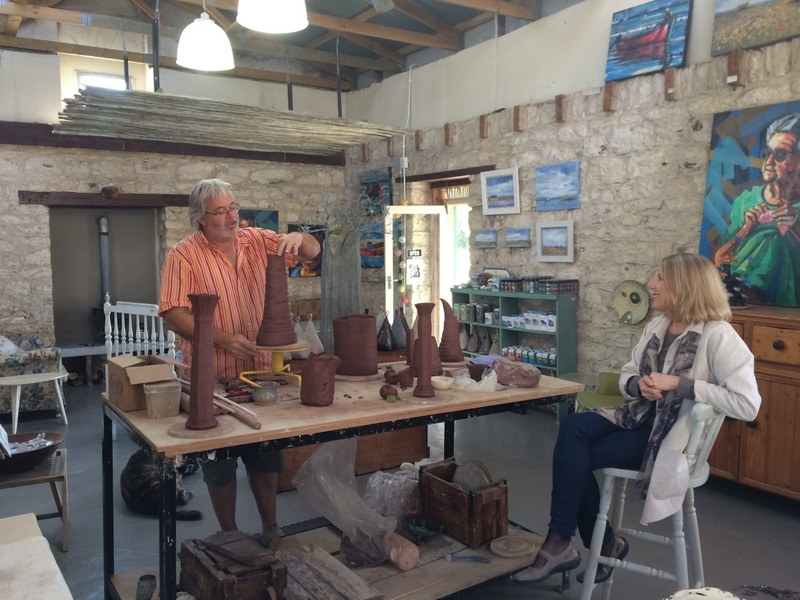 What a great week it was when Hennie Meyer was in residence at Stone Fish Studio in Paternoster! Not Paris! Rome! NewYork! but Paternoster! Hennie spent a week gathering inspiration from the quiet tranquility and beauty of this isolated fishing village on the Cape West Coast. Working at least six hours solidly each day Hennie build up quite a range of exotic and endearing shapes. His process is one of formation and creative deconstruction. The vessels emerge slowly from the rhythm of his hands, each unique and with individual characters. However, the secret ingredient to Hennies worldwide success as a master potter was revealed! 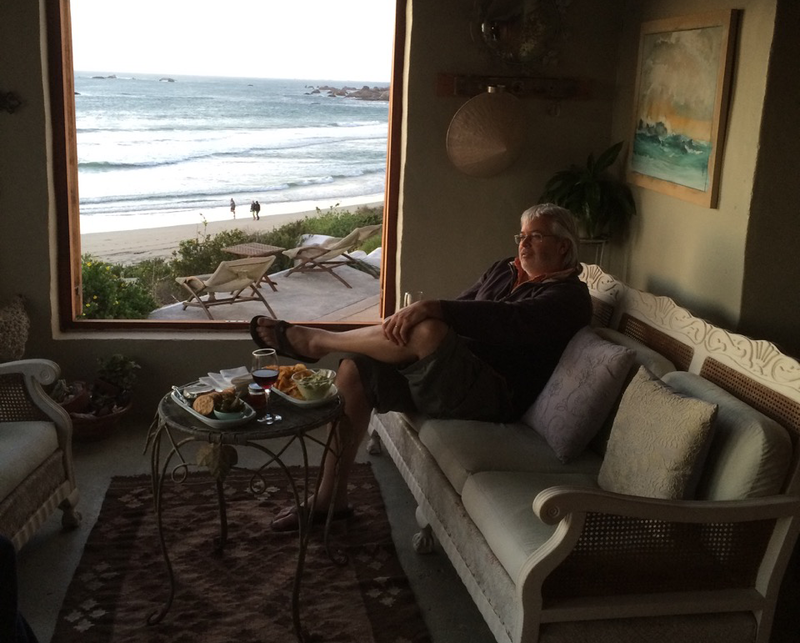 Hennie discussing art and Paternoster sunsets with Paternoster resident Arita. 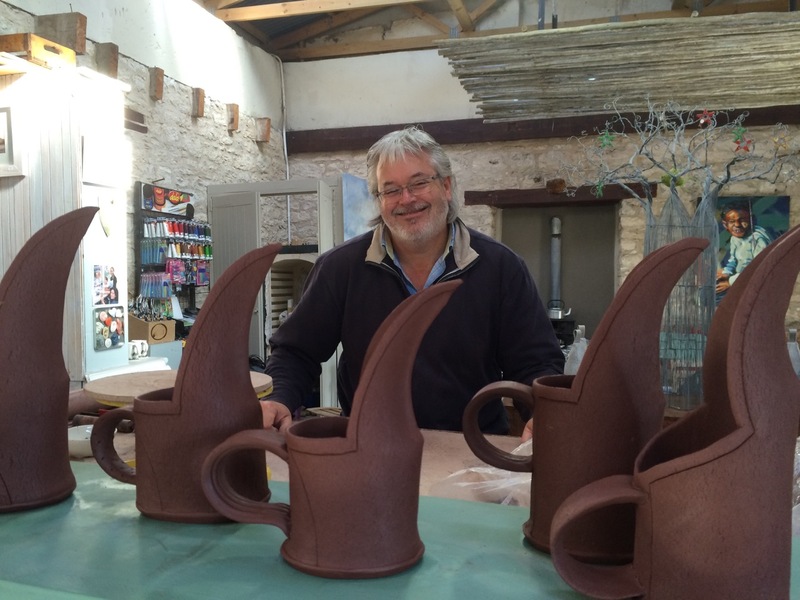 Hennie Meyer is a consummate master of clay who constantly redesigns and reinvents while his creations are very solidly grounded in family. He has the lightest of touch with the clay, to which the black plasticity of his medium responds gracefully. Impossibly thin tall vessels emerge almost effortlessly. Then, on this basic platform or canvas he adds, cuts away, reshapes, folds joins and inscribes his own particular brand of design. That is the trademark of a Hennie Meyer work….always unique. Hennie and I discussed the sad practice of many aspiring potters. Imitation or copying of another’s work is rife. Pinterest and coffee table books are often the images that people use to begin a work. True design and inspiration must come from a real place… from experience, ones environment, a constant searching for a source of truth, and of course nothing beats hard work. 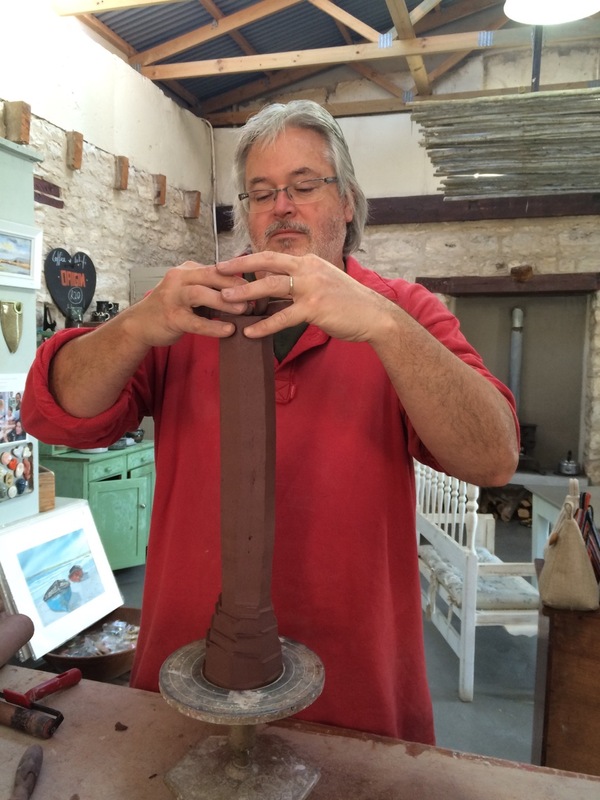 All work produced at Stone Fish Studio during his residency will be exhibited in September. 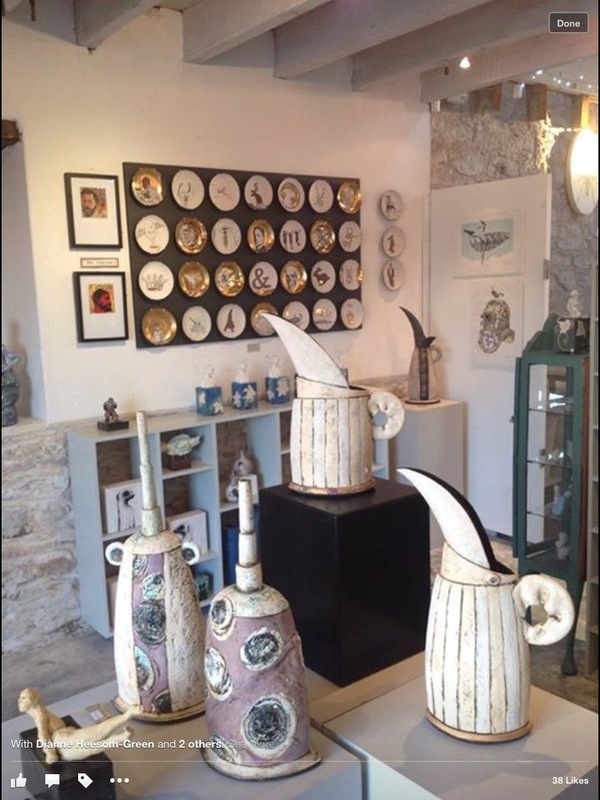 Watch on Facebook Stone Fish Studio and Gallery Paternoster for the opening of this special exhibition. Hennie Meyers pieces are designed in conjunction with each other. He pays the greatest attention to how each vessel relates to its sister pot. How they nestle together or give emphasis to each other. The negative spaces are all important to Hennie. Often he concentrates mostly on the inside of a handle or the underside of a jug spout. It was a revelation in positive and negative shapes to watch him design. Each little squeeze or indent has a purpose…often not apparent until seen in conjunction with another member of the Hennie Meyer body of work. This is why his forms are a family…his mugs play together, his jugs and teapots dance an eternal curtsy to each other. She more of Hennie’s work and follow more exciting happenings on our Facebook page.